Name of recipe suggestion Supersweet sweetcorn and courgettes salad. 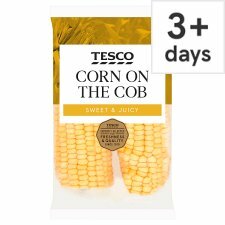 Ingredients: Kernels cut from 2 Tesco Supersweet Sweetcorn cobs; 6 small young courgettes, diced; 6 rashes smoked streaky becon, rings removed; 125ml mayonnaise; 125ml fromage frais, cream fraiche or greek yougurt;1-2x5ml (1-2tsps) light soy sauce;2x15ml(2tbsps) chopped chives, basil or parsley; black pepper. Method: 1. Place courgettes in a sieve and sprinkle lightly with salt. 2. Leave to drain excess moisture for 30 minutes, rinse and then pat dry. Grill bacon until crisp and chop. 3. Combine Supersweet sweetcorn and all other ingredients with prepared courgettes. 4. Mound into a serving dish, sprinkle with chopped bacon and chilli before serving. To Serve: The salad is delicious on its own, alternatively add tuna or turkey for extra flavour. Serving Suggestion: Check food is piping hot throughout before serving. Remove all packaging. Wash before use. Microwave (800W) 5 mins / (900W) 4½ mins Place in a non-metallic bowl, add 2 x 15ml (2 tbsps.) of water. Cook on full power. Turn halfway through cooking. Leave to stand for 1 minute after heating. Oven 200° C/Fan 180° C/Gas 6 10 mins Wrap in foil and place in a pre-heated oven 200° C/Fan 180° C/Gas Mark 6 for 10 minutes or until tender. Barbecue 10 mins Wrap in foil and place on a hot barbecue. Cook for 10 minutes turning frequently. Preparation Guidelines: Remove all packaging. Wash thoroughly before use.